The Tropico series has been around for almost 20 years with the very first Tropico dropping back in 2001. In that time the franchise has been shelved and then later resurrected by Kalypso Media buying the rights to the IP. Somehow in all this time, I have never had the series on my radar. I was a big fan of Sim City 2000/3000 and never really felt like branching out. That is until a behind the scenes look at Tropico 6 in the Kalypso booth during E3 2017. The demo was pretty awesome and after the event, I picked up a copy of Tropico 5 and really enjoyed my time with it. But now, the original reason for my interest in the series has finally been released and my time with Tropico 6 has been an even bigger joy! Your Presidente is totally customizable! Assuming the role of El Presidente, it is your job to lead your Carribean Island nation of Tropico! Decide what commerce will be part of your nation and navigate the political waters as you see fit. Tropico is yours to command and its success or failure is all in your hands El Presidente! You don’t start out with much with a new game! 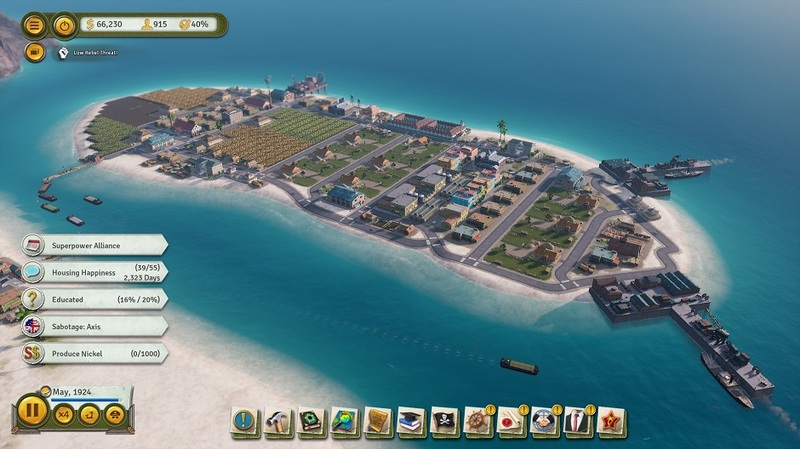 Tropico 6 is a city building, economic and political simulator. Everything from where roads will be placed to the system of government is fully under your control. Want to have a completely capitalist society or full-on dictatorship, you can! When you first start your journey of ruling Tropico however you are ruling by the mercy of the crown. You see Tropico 6 has 4 eras that mimic the eras the real world has undergone from colonial to modern times. During the colonial era, you are juggling the political relationship of the crown with that of the revolutionary presence on your island. Each side will request tasks of you during this early game period and thankfully they are usually related to helping strengthen an aspect of your citizen's lives or the economy as a whole. Building up your economy is one key aspect of gameplay because without money Tropico can’t grow! In the early game, the economy is fairly easy to get started. You have a small selection of options to choose from including fishing, ranches, plantations, and logging camps. You can then use these resources to make goods you can then export to the various factions available during each era. For example, I will use my plantations to grow sugar which is then taken to be turned into rum at a distillery. I will then export this rum to the crown for profit or maybe even a mandate time extension if the export happens to coincide with a faction task. I spent a ton of time playing in the colonial era to really nail down many of the gameplay basics because once you hit the world wars era and beyond things can get overwhelming quickly if you don’t understand the basics. Each era adds more outside nations to trade and negotiate with on top of adding your own governmental choices that will affect the lives of your citizens. Be careful of what edicts you put in place and how well you manage each political faction because there will always be the chance you could lose re-election! Worse yet if you tick off your citizens too much there is always the chance at full-blown rebellion. It’s ok though if you are that much of a ruthless dictator I am sure you have a big military presence to keep you safe! On top of the added political challenges, the economy will drastically change as you advance through the eras. An economy that has served you very well during the colonial era might become completely useless during the world wars era. Utilizing new industries that open up at the start of an era is always going to be the key to success. Using your lumber mills to make planks can lead to those planks now being taken off to make ships or furniture during the cold war era and modern era. Later eras also come with the added need of power and managing the resources used to make it like coal, oil or uranium. Tourism also becomes a big thing later on in a playthrough so be planning ahead on how you setup otherwise tourists might not be interested in visiting an ugly island. The thing I think Tropico 6 does best in regards to its gameplay progression is adding just enough to keep it all manageable. The first few games you play might feel slightly overwhelming at first but don’t worry you will figure it out quickly! If for whatever reason you do have any issues with any of the games large amount of systems, there are handy tutorials to help train you in all the basics. There are also missions available to further teach you about specific things need to be learned to complete them. By the time you finish the mission mode, you will be more than ready to tackle any sandbox map of your choosing! This guy is ready to move supplies! Tropico 6 is a beautiful game! This is the first game in the series to be built with Unreal Engine 4 and the overall presentation is a night and day difference to Tropico 5. I often find myself staring at the waves rolling in on the beach or a particularly mountainous side of my island. I also like zooming the camera all the way in and follow a resident of my island around as they would go about their days. The detail levels present are just awesome! I also love all of the customization options that are available for your presidential palace. If you want to unlock all of the customization options however be prepared for a lot of playing! Tropico 6 has an awesome upbeat soundtrack composed of Carribean/Latin themed music. This normally isn’t my style of soundtrack but here it works out wonderfully! I was also happy to hear plenty of voice work when it came to faction tasks and presidential speeches. Speaking of the Speeches, these things are gold! You get to choose from a select set of options on what to cover to try and score points for reelection and some of the lines are fantastic like “you shouldn’t worship outside during hurricane season” pure gold to me. With a game as intricate and massive as Tropico 6, I expected to have a lot more complaints. Surprisingly in the hours I have invested into the game the only thing I kept getting up in arms about was the road building system. I love having nice looking roads and can get fairly OCD on the matter. The limitation of not being able to place multiple turns within a tile of each other constantly drove me nuts. This probably won’t bother anyone else as much as it did me and I am ok with that! Tropico 6 is a fun game to play despite it aggravating my OCD at times. It was very easy to lose myself for hours at a time trying to build up my ultimate society. Each playthrough brought about new discoveries on how to properly setup something or how to better research my edicts to better drive my society forward. I know I barely scratch the surface with this review but the bottom line is Tropico 6 might just be one of the best games in the genre! If you are looking for an involved city builder with a little more to it Tropico 6 is the game for you! X4: Foundations Review: Playing From The Eyes Of An Outsider!